He's not there yet, but just 10 days to go and Barack Obama will know if he plans to live the next 4 years of his life in the Whitehouse. Meanwhile, he spent 2 days away from his campaign visiting his ailing grandmother, Madelyn Payne Dunham who is seriously ill after a fall in her apartment. Barack Obama does not expect to see her alive again, and left the campaign to his running mate Joe Biden, Hilary Clinton and his wife Michelle, as they continued their speaking engagements in support of their nominee Barack. The local newspaper in Hawaii, The Honolulu Advisor, is the local newspaper there covering the story of Barack in his old neighborhood. The neighborhood that he was in seems to be so similar to the neighborhoods in the lower 48 states. 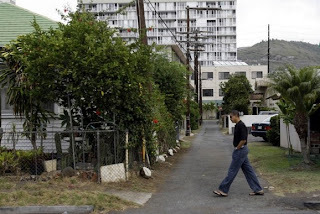 Many people had the idea that Barack Obama lived in a neighborhood of fantasies and dreams, a place that many people would love to be in because it's HAWAII. Suprise!!!! His old neighborhood is no different than any moderate income neighborhood in Philidelphia, Chicago, Pittsburgh or dozens more. Pictures of him walking his old neighborhood tells you how deep he is into his roots there. Nevertheless, he has now returned and continuing his campaign in the state of Nevada. Just 10 more days to go, and he and so many people will realize that their dreams can come true, and the hope that he brings so many people can be the beginning of a great recovery for this nation.